Fimo dragon in an egg. Adjustments: added text & black line. Changed levels, added brightness & contrast. Cloned out a few distracting sparkly bits. This was such a cool composition. Your choice of text & placement made this shot. This is really fun. Like it alot. LOL....beautifully descriptive title, creative idea. 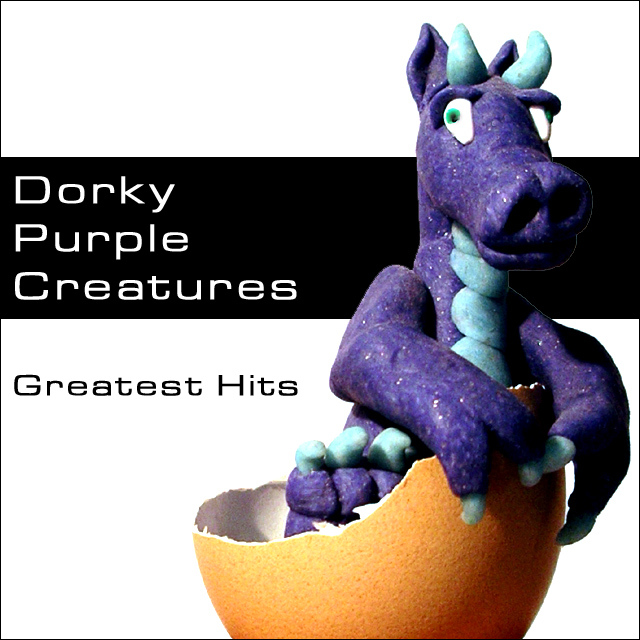 I like the simplicity of the background of this image, makes the dorky purple creature really stand out! Cute - nice image well placed. I really like the way you did the white-black-white background. A very minor point - but "greatest hits" is not likely for a DEBUT album. Not usually a fan of "toys" in challenge photos (if that's what I sould call this), but this is just too cool! Incredible job you did. Very well done. Too funny! Lots of effort went into this. Hope your hard work pays off. The dark black bar is distracting from your creature. Di you try it in another color or perhaps grayed? I love the dinosaur and the egg, but the rest of the composition just isn't working for me. The black and white seem so disappointing with such a fun and exciting focal centerpiece like the dragon. The creature seems blurry or at least not sharp enough around the eyes. I like the photo and the text is great. Lol, nice shot :) Good job on the editing too. Proudly hosted by Sargasso Networks. Current Server Time: 04/19/2019 08:17:54 AM EDT.